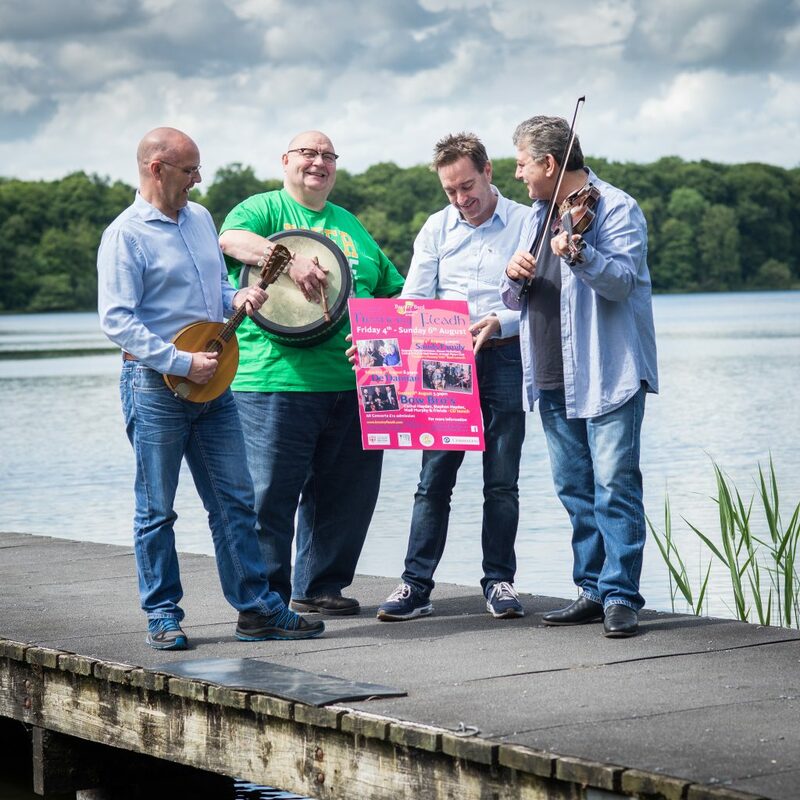 Cllr Dominic Molloy, Mid Ulster Council, joins local musicians and event organiser to launch the Brantry Fleadh 2017, at the beautiful setting of Brantry Lough L-R Cllr Dominic Molloy, Gino Lupari, Event organiser Mark Mohan, & Cathal Hayden. The weekend of 4th-6th August will see the return of the Brantry Fleadh 2017. Supported by the Mid Ulster Council and Comhaltas Ceoltoiri Eireann, this significant annual event at The Brantry Bard Cultural Centre, near Dungannon, Co Tyrone, will see a series of Concerts each evening followed by music sessions, lasting into the wee small hours! The Fleadh commences on Friday 4th August with an evening of song and storytelling featuring the renowned Sands Family, returning to the Brantry Fleadh for the second time in recent years. Born, bred and based in County Down the Sands Family has been entertaining audiences across the world for close on 50 years! There’s a great night’s ‘craic’ in store. They will be supported in song by ‘Dobbin’s Daring Crew’, featuring local men Cathal O’Neill, Niall Hanna, Armagh’s Pearse McMahon and Derry’s Eimhear Mulholland, who will sing a selection of song’s from ‘By Dobbin’s Flowery Vale’, an Armagh Pipers Club collection of local song’s, which will be launched at the Fleadh on Friday night. On Saturday 5th August there will be Traditional Music and Song Master Classes, under the guidance of some of Irelands leading Traditional Musicians; Ronan O’Flaherty, Niall Murphy (Fiddles), Derek Hickey (Accordion), Brian McGrath (Banjo), Kevin Crawford (Flute), Brian Finnegan (Whistle), Steve Cooney (Guitar), Neill Lyons (Bodhran), Alec Finn (Bouzouki) & Eleanor Shanley (Traditional Singing). The workshops will be followed by legends of Irish trad, De Danann. Once described as ‘the Rolling Stones of Irish Traditional Music’, the legendary group De Danann, returned to the festival stage with a new album ‘Wonderwaltz’. They will be supported by the flute and whistle duet of Kevin Crawford & Brian Finnegan from the super groups Lunasa and Flook, accompanied by the masterful guitar playing of Steve Cooney. The weekend will conclude with our very popular Sets Ceili, with music performed by the 2014 All-Ireland Champions The Knockmore Ceili Band, followed no doubt by a monster session into the wee hours! Tickets for all the aforementioned concerts, workshops, ceili and fun run are available on line at www.brantryfleadh.com or at Gene Stuarts Music Shop, 9 Irish Street, Dungannon Tel: +44(0)28 8772 5286. All Concert Admissions £12. Booking in advance advisable! Further information on the Brantry Fleadh 2017 and Music Master Classes is available on: www.brantryfleadh.com / +44 (0) 7771 607 840 / Email: info@brantryfleadh or follow us on Facebook!